Hope is a powerful thing. Without hope, a population of sports fanatics and non-sports communities are merely a ship lost at sea. In regards to the Colorado Rockies, immense hope has developed over the past two years. In 2017, the franchise made their first postseason appearance since 2009 by way of a Wild Card game against National League West rival, the Arizona Diamondbacks. Building off of their momentum, the team once again garnered a playoff berth last year, advancing to the NL Division Series. Though they fell in a sweep at the hands of the Milwaukee Brewers, the step forward in the bracket symbolized a new level of success that was imminently possible. Heading into the 2019 season, hope remains for the Rockies to take the next step amongst the populous of Colorado and beyond. In their pursuit of a third-consecutive playoff berth and eclipsing the divisional round of the playoffs, a quartet of storylines has come to the forefront in their efforts. In their shortage of moves, the Rockies have yet to garner an upgrade to last year’s starting rotation, the fourth-best in franchise history by earned run average. Though their lack of moves can be concerning, the club is showing their trust in the arms already in the organization and relying on yet another step forward from staff ace, Kyle Freeland. Along with Freeland’s desire continue his upward ascent, the Rockies will hope to get a full year of German Marquez producing at the level he did in last year’s second half. The yearning for another standout year from Marquez extends to their desire for Jon Gray to regain his form as well. With the way Bud Black’s rotation shakes out, it appears the team will once again boast one of the brighter young rotations in the game. Outside of a veteran addition for a low sum, the team is showing they are content with their day-to-day starters. Prior to last season, the Rockies were picked to finish fourth in the NL West if you perused Baseball America’s projections. Atop the conference, in projections, was once again the Los Angeles Dodgers. For the past six seasons, no team has reigned atop the NL West outside of the Dodgers. Under a pair of separate managers in both Don Mattingly and Dave Roberts, the club has amassed a .580-winning percentage in the regular season in that same span. Heading into this offseason, the NL West leaders were slated to deal with the contracts of both Clayton Kershaw and Yasmani Grandal along with their expiring rentals in Brian Dozier and Manny Machado. To this point, they’ve had mixed results with the four. Kershaw, with the choice to decline his option, was given a slight raise despite injuries marring his last three seasons. The others, sans Machado, have signed elsewhere with Grandal heading to the Brewers and Dozier making his way to the nation’s capital. The final large question mark of the offseason was the team’s plan moving forward with last season’s biggest deadline trade acquisition. The Dodgers could pay Machado and set themselves up with a bevy of impactful infield hitters once Corey Seager returned, or go back to their nucleus of Justin Turner and Seager with Cody Bellinger manning first. The team appears to be choosing the latter with their recent acquisitions of both A.J. Pollock and Russell Martin. Now, with their trade of Matt Kemp and Yasiel Puig to the Cincinnati Reds, the Dodgers are set to pose a lineup headlined by Bellinger, Seager, Turner, Pollock and Muncy. Their staff will also be largely the same with a full year from Walker Buehler set to enhance it. In all, the Dodgers have improved financially while also staying relatively even on the offensive end, with a full year from Kershaw and Seager set to be in-house upgrades. 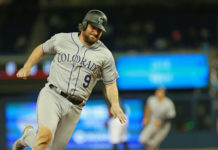 They are still the class of the NL West and appear to be lapping the field in the absence of impact moves by their counterparts. Whether it’s Charlie Blackmon or Ian Desmond’s relocation, the Rockies have shown they are looking to change their presence in the field. 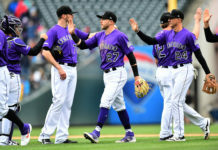 “We had a discussion about possibly trying different outfield alignments if it meant winning more games for the Rockies, and I was all about winning more games for the Rockies,” Blackmon said during media availability on Saturday. The changes are, in theory, set to improve the Rockies with a separate impact move notwithstanding. Moving Desmond to the role of utility fielder off the bench, with Blackmon moving to a corner outfield spot are both heralded. From the corner opposite Nolan Arenado, Desmond posted a .307 on-base percentage. That mark, among qualifiers, ranked 19th out of 21 first basemen, beating out only Ryon Healy and Chris Davis. His slugging percentage, though an improvement from his standing in on-base was a mere .422 and sat behind 12 separate first basemen as well. With Blackmon, his bat remained vital to the team, with his fielding becoming a hindrance. Among qualifiers, the Rockies’ center fielder was dead last in defensive runs saved among outfielders. In the rangy outfield of Coors Field, a move to alleviate the reliance on Blackmon manning the middle behind the Rockies young staff is advantageous. With the team already downgrading in the infield from D.J. LeMahieu to Daniel Murphy, the outfield switch is needed to juxtapose the downgrade. Among the many cliches, Arenado’s impending free agency is a case of “last but not least,” for the franchise. In his last year before free agency, Arenado’s contract extension is at the forefront of the club’s future. 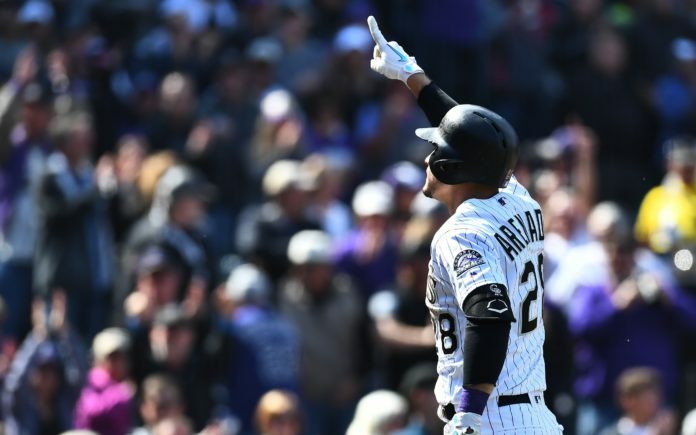 Set to turn 28 years old in the 2019 season’s first month, Arenado’s accolades have already begun to stack up. From the hot corner, Arenado has racked up a Gold Glove in each of his first six seasons, garnered four Silver Sluggers and finished top-10 in Most Valuable Player voting in each of the last four years. Rambling off stats does Arenado slight justice, with his absence of off-field incidents and locker room problems finishing the tale. Among the many free agents that have led headlines in recent years, Arenado is likely to be the best package among them. Though Bryce Harper and Machado have lore as well, their respective personality and health issues put a dent in their resumes. The New York Yankees have already been rumored to be interested in the superstar. With their abundance of finances when compared to the Rockies, the club will have to make their case elsewhere. In both acquisitions prior to and throughout the year, the club will be forced to once again prove to Arenado their desire to win. The story is well documented already. If an extension fails to rear its head preceding the year, the storyline figures to dominate the MLB landscape for much of 2019 as well.